The mother glider is quite large now. 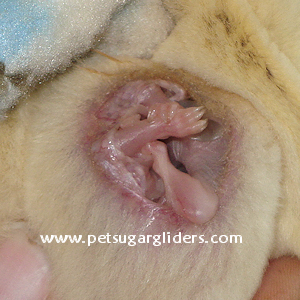 The baby is visible through the pouch as the skin is stretched fairly thin and is semitransparent. 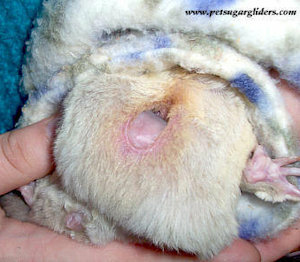 On occasion you may see a tail or foot slip through the pouch opening. Many breeders lower the sleeping area to prevent possible injuries to a newly out of pouch joey. Twins in pouch approximately 4.5 weeks. Twins in pouch approximately 6 weeks. They are still very shiny and are just starting to show a hint of color on the ears. Twins in pouch approximately 6.5 weeks. Notice that the joeys are still shiny, but are starting to get color on their dorsal stripe. 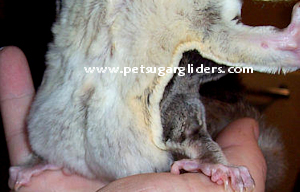 This is a short video of a female caramel sugar glider with a joey tail and foot peeking out of pouch. Joeys are approximately 6.5 to 7 weeks in pouch. Notice the tail is shiny, but has color.